Many people who work from home can find that sitting alone in their room is less than inspiring. Yes, the dress code is more lax and your fridge is just a few steps away, but being your sole motivator can get to be difficult day after day. Enter work-from-home groups, aka coworking. It’s a growing community built entirely of people who work from home but who want — and need — people around them so they can do their job and do it better. Places like meetup.com, Jelly and ShareDesk list a variety a groups for telecommuters and freelancers with no office to come together and do their jobs. People who have been a part of these meetups say having other telecommuters working around them keeps them focused — it’s as if everyone is keeping an eye on each other. Of course, there’s also the benefit of having a diverse crowd of thinkers around, because you never know what you’ll learn in the process. A report put out by the New Jersey Institute of Technology’s online MBA program shows 45% of the U.S. population now works from home. According to the report, between 2014 and 2015 the number of people who work remotely rose by 27%. 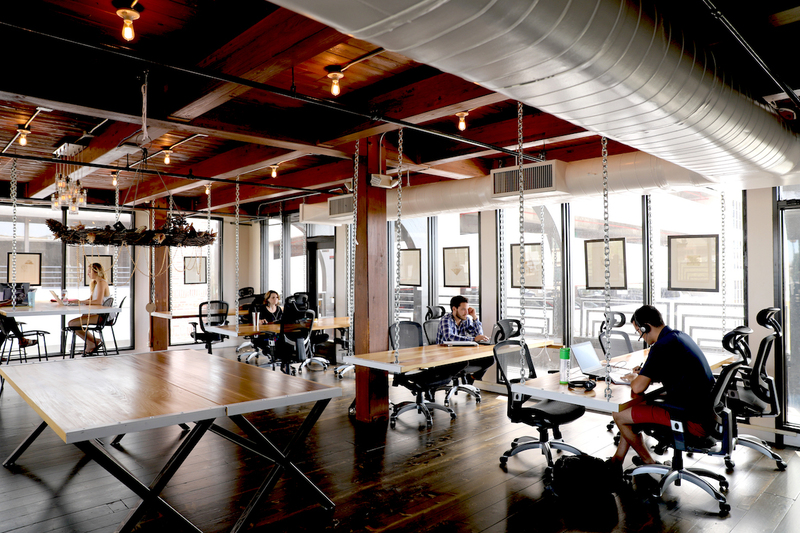 When it comes to coworking, the numbers are comparable. Deskmag, an online magazine, reported the Global Coworking Survey found by the end of 2017 almost 1.2 million people throughout the world will have worked in a coworking space. To put it in perspective, the survey shows nearly one in five coworking spaces has 150 or more members in it. It’s no secret that meeting and connecting other people in your field works in favor of your career. But for a lot of freelancers who don’t always have the same steady office group to rely on, it’s hard to make it to networking events or mixers. Coworking makes networking possible while you’re doing what you get paid to do. The New Jersey Institute of Technology report shows 38% of the people freelancing are between 18 and 34 years old. Ages aside, individuals who cowork are, more than likely, to have a similar career background. From Magiera’s experience, many of the people who come together to cowork are those looking to share ideas and gain knowledge, which he says can be as simple as learning how to obtain clients or run a business more smoothly. For people like Jerome Chang, coming together with other people who work remotely is a way to be more productive. Chang is the founder of BLANKSPACES, a coworking company comprised of various office spaces, so he knows a thing or two about working out of the home. His opinion is that a coworking setup eliminates the many distractions of being at home. Whether that’s pets or cleaning that needs to be done, it helps concentration. “Working alone can cause people to procrastinate and distract themselves with random stuff,” Chang says. Of course, the simple formula is less procrastination and distraction equals more productivity. It’s a win for employees and employers. For people like Chang who run a coworking space, these meetups are as much about a social experience as they are about a work experience. As mentioned before, working from inside an empty house or apartment can get lonely and it isn’t possible to go out every day. However, meeting up with people, in a makeshift work space incorporates that social experience that working remotely lacks. For people like Oliver Whitham, the founder of the Austin Virtual Workers meetup group, the benefits include having an environment that supports people getting their work done. Whit’s group has now grown to more than 1,200 members — a testament to how beneficial these meetups are for doing your job and networking with people you might not normally have met. There isn’t a set rule on how and where to set up a coworking space. Browse the web and you can find a conglomeration of places for at-home workers to meet up. While websites like Meetup, Coworker and ShareDesk are a good place to start, there are other search engines that can help narrow it down. A great option, especially for freelancers who job hop, is Find Workspaces, which lets individuals browse coworking locations by city, state or space and boasts a directory with more than 500 spaces. Because Chang’s company has several locations throughout California, members have more options where they can do their work. For someone who freelances, this can be useful as you’re not limited to one location. In other places, freelancers and telecommuters rent office space to share during the workweek. Working remotely isn’t limited to just open office spaces, though. Now, cafes are taking notice of the trend and becoming popular for people wanting a more casual work environment. Finding a coffee shop with a coworking initiative takes little more than a quick search on the internet. Cafes like Catalyst in Orlando provide different options for coworking and usually work through a signup process. Or, if you’re someone who is a part of Jelly – Entrepreneurs of Central Florida, you might be meeting in a person’s home one day and a coffee shop the next. If you, like many freelancers, already have an affection for the local coffee shops, one of the best ways to see if they have coworking events is just to ask or, if there isn’t one, start your own. Starting your own coworking group can be as easy as setting up a Facebook page or listing your group on Meetup. Keep in mind, on Meetup, there is usually a fee to put a group listing. However, if you want your coworking group to grow, like Chang’s, then the financial investment will be worth it in the end — more so if you’re charging a membership fee. Human interaction still plays a large role in the desire to co-work and, as Mageira points out, it’s helping telecommuters overcome feelings of isolation to create a more positive work environment. Nichole is a freelance writer who knows about at-home distractions. You’ll usually find her tapping away at her laptop in the corner of a coffee shop near the beach.